Affordable housing for the Mission. Not Luxury towers. Order your tickets now! 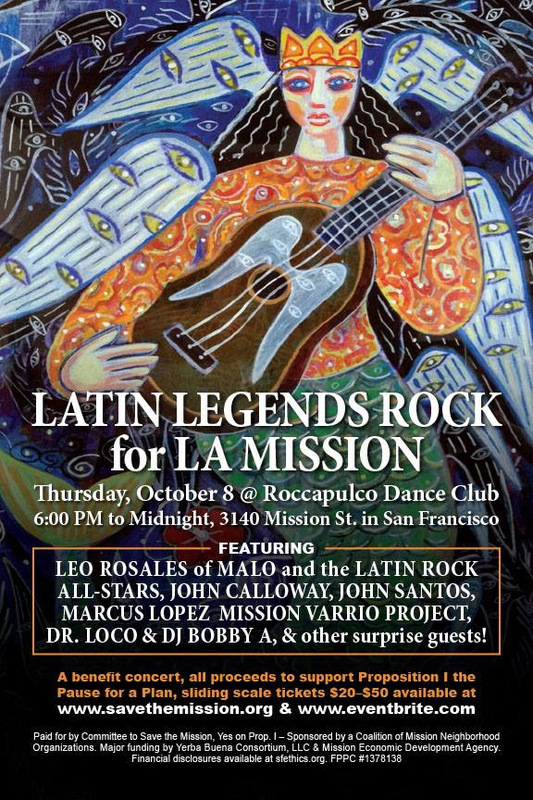 Come ROCK OUT with Latin Legends including Leo Rosales (formerly of Malo), John Santos, Dr. Loco, John Calloway, Mission Varrio Project, and MORE! Join us in this historic celebration of the Latin American music, culture, art, stories and people that make the Mission District in San Francisco so unique. All proceeds go to Proposition I, the pause for a plan to save the Mission. Viva La Mission! 11:45 Gather 12pm-1pm Press conference + public rally on City Hall Steps 2pm Board of Supervisors public comment 3pm Office of Mayor Ed Lee sit-in RSVP on Facebook http://bit.ly/savemidtown 65 Families Face An Average 120% Rent Increase, Forced Displacement, Eviction Threats Midtown is the only city owned apartment complex that is not public housing, the tenants have paid off the property mortgage in 2007. A lot of tenants lost their Fillmore based Victorians to eminent domain during the civic redevelopment and were promised equity ownership upon mortgage satisfaction. However that promise has been broken, instead we face eviction threats from Mayor’s Office of Housing, promising to start evicting people on 10/12 It’s time for Midtown to take over the City Hall. Public officials have been deaf to our pleas asking them to stop willful destruction of our community. We’ve written letters and called. We came to Board of Supervisors hearing. We filed the largest rent control petition in San Francisco history and lost. No housing attorney in San Francisco will take our case. Now we must do what people who can’t get their voices heard do – take our case directly to the people in charge. We’ll be doing a large sit-in until we get our 30 minutes with the mayor, we’ve been asking for this opportunity for months – but were denied. ← PASS EVICTION PROTECTIONS 2.0 NOW!